Winter is here and most of us are ready to put the RV into storage for the season. Glaciers, snow and ice can make for an amazing experience, but definitely require some extra preparation. What could be more amazing then watching family that otherwise never sees snow enjoy a white Christmas and New Year. Going skiing and sledding or just having an old fashioned snowball fight. These are memories that will last a life time. Watching the joy on your kids’ faces the first time they make snow angels. 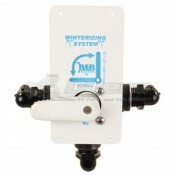 For people that live in the freezing climates the snow and ice present challenges for their RVs. Winterizing requires a lot of preparation to make sure that nothing freezes or gets damaged. We all love to travel and explore in our RV but during the winter months it becomes hard to travel and navigate frozen and snowy roads. Most people end up storing their RVs for the winter, saving their traveling for the warmer times of the year. When getting your RV ready for the winter make sure to drain and clean your water systems including the fresh water storage. When winterizing, it is important to make sure to drain all your water and set everything up to prevent your water system from freezing. Also, it important for the protection of your RV to cover it while storing. Also, empty your black and gray water storage tanks. Once you have cleaned and sanitized your drained water systems. You need to install a non toxic RV water anti-freeze. Protecting your water system from getting frozen and damaged means that once the roads clear and spring rolls back around your RV is ready to hit the road and see all the amazing wild flowers and waterfalls at our national parks. Do not risk damaging your RV, make sure you properly winterize.